After four years of casting losing votes, Bonnie Mager hopes voters give her a win. Two-to-one. In any game, or on any battlefield, those odds generally signal a loss for the overwhelmed and outflanked loner. Just ask Bonnie Mager. Since joining the board of county commissioners almost four years ago, she has suffered loss after loss at the hands of the other two commissioners — Todd Mielke and Mark Richard — who regularly form a voting bloc against her. Why? Her fellow commissioners are in the pocket of special interests, says Mager, a Democrat. Thirteen months ago, Republican Al French announced he was challenging Mager in the Journal of Business, an avenue he preferred because, “I see myself as business-friendly,” he told the paper. French, who served eight years on the Spokane City Council, has been an architect for more than 30 years. And though he says he will listen to every constituent who comes to him with a problem, he’s unapologetic about how he views the world. At a recent debate, Mager and French were asked about the “benefits and drawbacks” of the state Growth Management Act, which gives guidelines for local governments to control urban sprawl. Mager’s answer dug deeper into the county’s balance sheet. She discussed how revenue has been hobbled by a voter-approved cap on property tax increases, as well as by the annexation of income-tax-rich county property by surrounding cities. Last year, commissioners plugged a $10.5 million hole in the budget, mainly by cutting 114 positions from the county’s rolls. It may have been a financially sound answer — even if it probably wasn’t the wisest thing to say during election season — and French soon rolled out a clip of her response, which has circulated on Facebook. Regardless, Mager’s approach to the county’s finances has earned her plaudits. 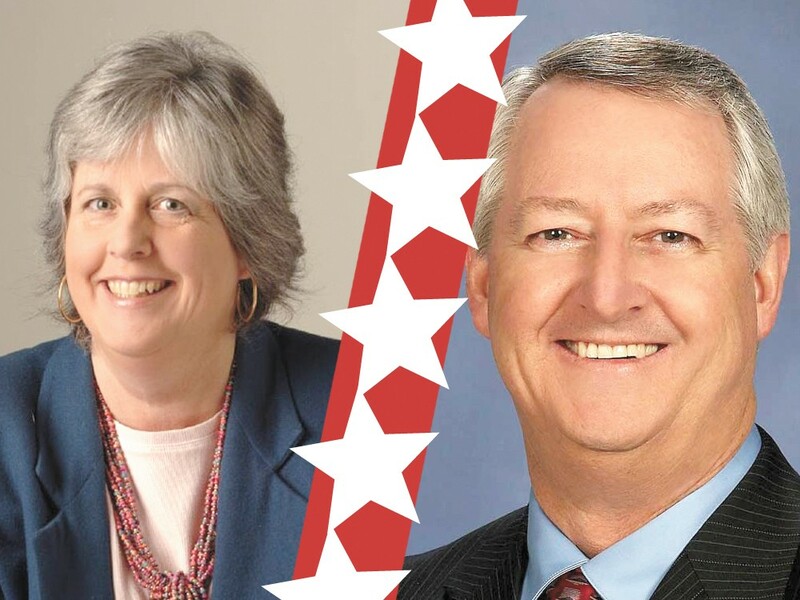 “The interesting thing about Bonnie, on many of the fiscal issues, she’s the one speaking out for more of the conservative approach,” former Republican Commissioner Kate McCaslin said last year about Mager. McCaslin is supporting French in the race. Mager’s two pet issues in the campaign are the county’s purchase of the Spokane County Raceway on the West Plains and the proposed expansion of the jail. Almost from day one, Mager opposed buying the racetrack, which is estimated to end up costing the county $7 million. Mager has called it a “totally irresponsible” use of county funds. French agrees — to a point. Of the 51 2-1 votes recorded since Bonnie Mager joined the county commission, she cast the minority vote 60 percent of the time. French admits he wasn’t as informed on the raceway as he should have been. When it comes to expanding the jail, however, French is more blunt. But he doesn’t support a new jail simply as a get-tough conservative, he says. Despite a recent dip in jail population, more room is needed for inmates, he says, and slowly building jail pods in Medical Lake is the wisest financial decision. Mager, however, wants to put the brakes on the $210 million project. And, surprise, she frequently finds herself on the losing end of 2-1 votes concerning the jail. “One of the priorities of government is certainly public safety, that takes up most of our budget,” she says. “My feeling is that we haven’t done a good enough job to show people” that we’re building the right-sized jail. Mager argues that “evidence-based programs” haven’t been given a chance to succeed fully at the jail, programs like work release and electronic monitoring. She also says that people with mental health and substance abuse issues shouldn’t be locked behind bars. French considers the eight years he spent on the City Council as his biggest strength heading toward Election Day. He says this experience will allow him to elicit greater cooperation from municipal leaders. Mager, however, points to the municipally elected officials who support her: Spokane Mayor Mary Verner and a majority of the Spokane City Council; Spokane Valley Mayor Tom Towey, Liberty Lake Mayor Wendy Van Orman, Cheney Mayor Tom Trulove and Rockford Mayor Mickey Harnois. “Four years in office, tell me something she’s led.